This is the fourth and final post about our weekend trip to Portland. Other posts in this series include A Summer Weekend in Portland Maine, Duck Fat, and Eventide Oyster Company. Believe it or not, this restaurant was the main purpose I chose to visit Portland out of all the weekend destinations close to Boston.I’d heard so many great things about it.The guy I sat next to at the supper club-esque Dining Alternative raved about the food at Sushi Miyaki. The wine guy at Bergamot told me he thought it was the best sushi place in all of New England, including Boston. News articles talked about how the omakase was a steal at $65, especially compared to what else you could get at that price. Once we had our hotel booked (thanks to Bryan’s numerous hotel points! ), the first thing I did was to call Sushi Miyaki. I was pleasantly surprised that at the last minute (just a couple days before arrival), I was able to snag a 7:30PM Saturday evening reservation at the sushi bar. This would never happen in Boston at a place like O Ya or Uni Sashimi Bar, which seem perpetually booked on weekends. Sushi Miyaki is part of a larger group that also includes Pai Men Miyake, a more casual noodle bar that serves other Japanese-inspired bites, Miyake Farm, which sources a lot of the restaurants’ ingredients, and Food Factory Miyake, the catering arm. All of these lead back to Chef Masa Miyake, a highly successful and popular Portland chef and restaurateur who was just nominated for a James Beard Award for Best Chef Northeast in March of 2014. Sushi Miyaki is the flagship, and it’s where it all started. I knew I wanted to try the omakase ($65), the chef’s tasting menu I had heard so much about. If you like having a bit more control over your food, you can do a 4-course menu for $50 where you get to choose which four courses you want. There are also vegetarian omakases, where you can get three courses for $30 or four courses for $40. Our meal began with Hijiki Seaweed Salad. Hijiki is a chewy type of seaweed that is very salty, extremely flavorful, and full of natural umami from the seaweed’s rich glutamate content. I enjoyed this, especially with the added sesame seeds. Do note that high levels of inorganic arsenic have been reported in hijiki and the USDA advises against eating it, so definitely don’t eat this on a regular basis, which can increase cancer risk. We gasped when the next course arrived. Just barely charred grilled uni (sea urchin) from Chile (apparently the local ones weren’t in season at the time) was paired with a mushroomy sake. The uni was smoky, creamy, just a tad bitter, and had just a bit of that uni stink that I don’t like (and see more often in the US than in Japan). Bryan, who loves anything uni, really liked it. In fact, he later said that this was his favorite course of the entire meal. I thought it was OK, but I’ve had better uni at other places in Boston. The next course consisted of clams steamed in sake and dashi. These clams were extremely fresh and very sweet. I really liked how the bitterness of the sake complemented the rich and buttery sweetness of the clams. It worked really well. Next we had a Lobster Chawanmushi, a Japanese savory steamed egg custard. Inside, there was also Shitake mushrooms and mitsuba, a type of Japanese parsley. This dish was delicate, balanced, and overall very nice. Then came a huge sashimi plate with two pieces each of the following: lobster tail sashimi with garlic oil, salmon belly, snapper, striped bass, yellowtail, and monkfish liver. The most interesting item on this plate (at least for me) was the lobster tail sashimi. You would think that living in Boston all these years I would have tried this before, but I hadn’t! I loved it! It was super fresh, sweet, and tender. The garlic oil was a nice touch. Another favorite was the salmon belly, which was delightfully rich, fatty, and full of flavor. After finishing the sashimi, I was already starting to feel a bit full. I had no idea how much longer the tasting menu would last, but there had already been quite a lot of food. Next came a huge plate of whelk, or local sea snail, served artfully with the shell. Although the shell was present, most of the whelk had been removed, chopped up, and stir fried with anchovy butter. The texture of whelk was quite chewy, sort of like abalone or squid when it’s been cooked a bit longer. I thought it was alright, but definitely very, very rich. The anchovies added a lot of umami, and the butter added a ton of richness. In fact, Bryan found the intense butter flavor to be so overwhelming that it caused almost a gag reflex for him. He could not eat it. Sadly, it was the one course that he sent back, untouched. I ate about half of it, but found it hard to finish because there was just so much of it. At this point, I was feeling pretty full. The next course was very interesting. It was a small portion (in a big plate!) of a rich and dense bone marrow chicken broth served with just a dab of yuzu kosho on the side. Yuzu kosho is both citrusy and floral but also very spicy and salty. The sharp flavors of the yuzu kosho worked well in cutting the richness of the round, buttery soup with saltiness and spiciness. The next course was Seared Duck Breast served with truffle oil balsamic vinegar and pickled veggies. The duck was perfectly cooked and was delicious with the accompanying sauce. I was stuffed at this point, but we had one more course to go. Of course, you have to have sushi at sushi restaurant. We each got three pieces of sushi: chutoro (fatty tuna), tai kinmedai, (sea bream), and a type of fatty sardine whose Japanese name escapes me right now. The quality of the fish was very good and fresh. The quality of the rice was average at best. It wasn’t that soft or chewy. Instead, it was a bit harder and broke pretty easily. The word chalky came to mind. I did love their pickled ginger, which was delicious. The tasting menu had finally concluded. We had the option of adding dessert if we wanted. I was intrigued by a menu item called Yuzu Soufflé. I love soufflé, and don’t get to eat it very often. I can probably count on one hand the number of excellent soufflés I’ve had. Alas, this one wasn’t a freshly baked hot soufflé. It was instead a cold pre-made cake topped with a sweet yuzu glaze and served with an almond macaron and whipped cream. I found it to be average. It was quite sweet (sweeter than a typical Japanese dessert) and pretty mono dimensional in flavor. On the other hand, I actually enjoyed the mini sweets at the end, Matcha Macarons. Even though they didn’t really taste like matcha, they at least had a nice texture and still enjoyable to eat. There’s no question this is a great deal. There was so much food for only $65. And the food is overall solid. There were some very good courses, a few misses, and several that were perfectly fine but did not stand out. Personally, I still think the top places in Boston have better sushi overall. However, this place would sit comfortably among the top ten or so Japanese places in Boston. What’s nice about Miyake is that it is unusual, creative, and definitely different. Miyake is very passionate about local produce, I mean, the guy has his own farm! Dishes like butter sauteed whelk and chicken marrow soup with yuzu kosho just aren’t things you find at your local sushi joint. 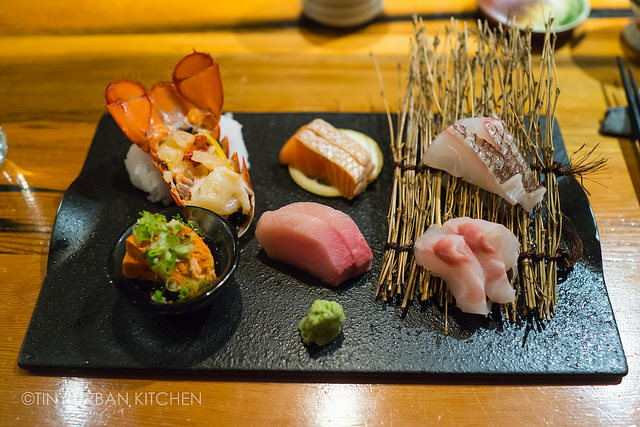 The omakase is not just a sushi or sashimi tasting menu. It incorporate all different types of cooked Japanese dishes inspired by local ingredients. Even though I personally prefer a more sushi/sashimi focused omakase, I’m sure there are lots of people out there who would enjoy the variety and creativity (not to mention generosity) of this tasting menu. At the end of the day, if I came back, I probably wouldn’t do the omakase, especially knowing that it’s way too much food for me. Instead, I would happily go with the a la carte option, or at most try a 4-course tasting, and skip dessert. We went to Miyake over the 4th this summer and ordered off the regular menu – we thought it was solid but slightly underwhelming. We were at Uchiko in Austin, TX in the Spring, which may have ruined our future “inventive sushi” experience because it was mind-blowingly good and far better value than O Ya (before you factor in the airfare, of course). Eventide was amazing though – we loved it! That unidentified nigiri looks like kohada? glad to read your review and I know if I return this will remain on my list!